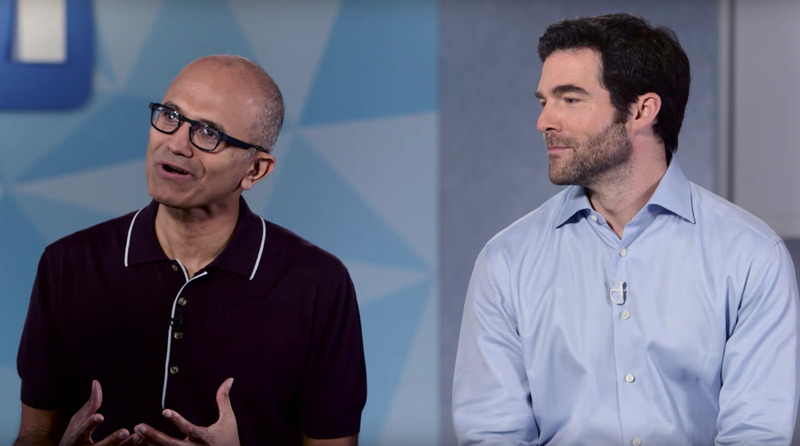 Satya Nadella and Jeff Weiner talked to Business Insider this morning about why Microsoft just bought LinkedIn for $26.2 billion, the largest tech acquisition since the the peak of the dot-com era, when AOL spent $162 billion to buy Time Warner. Why was Microsoft willing to pay such a hefty price for LinkedIn? Does it help Microsoft expand the addressable market? “If you look at those three questions, LinkedIn checks all those boxes,” Nadella said. One scenario he mentioned was walking into a meeting and getting a snapshot of each person in the meeting based on their LinkedIn profile. LinkedIn’s stock has had a wild ride as well over the last six months, at one point losing more than 40% of its value in a single day after a disappointing Q4 earnings report in February. But Weiner denied that the sale was driven by any particular anxiety to sell or market conditions. Reid Hoffman, the LinkedIn founder and chairman, stated his support for the deal in the announcement, but his role at the new combined company has not yet been revealed. “As we close it, it will become clear as to exactly what role Reid will play,” said Nadella.